If you do not want light fixtures that take up too much space in your bedroom, wall sconces are a great option. These light fixtures create a soft glow that helps you create a peaceful feeling in your bedroom. You can place wall sconces on either side of the bed to add to the aesthetic appeal of the space and bring more function to the bedroom’s design. Some people prefer to use overhead lighting in their bedroom. Since you do not want your lights to be too bright, though, you might like the way a chandelier works with the space. Chandeliers can become an essential aspect of your décor and provide the kind of lighting you need for your bedroom. The best way to light any room is to incorporate a few different kinds of light fixtures. Use a ceiling fan with light fixtures to serve as a kind of task lighting. 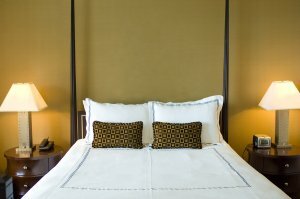 Add some lamps on either side of the bed so you can read before you go to sleep. You can also include some recessed lights to complete the look. If you want to create a romantic appeal for your bedroom décor, you should consider using pendant lights in the space. Pendant lights are another great way to save space in your bedroom without sacrificing your interior design aspirations. You can use pendant lights to create brighter lights or dimmer lights that help you create the ideal atmosphere inside your bedroom. Our staff is here to help you find the perfect light fixtures and decorative features that allow you to add energy efficiency to your home. From our fireplace gas conversions to LED lighting, we make it easy to find eco-friendly elements to use in your home. Our light fixtures are thoroughly tested to ensure that they bring the optimal energy efficiency you need for your space. Come in today to talk to our staff about your lighting needs so we can help you find the right products to use in your home. If you want to start living a more eco-friendly life, we can help. Recessed lighting in San Jose adds a lot of style and function to your home. Installing this kind of light helps you create a specific mood and style for your space. Using a certain kind of light bulb can help you make recessed lighting even more efficient. You should opt for LED light bulbs for your recessed lighting to get the longest lifespan from your bulbs. LED lights are a great investment for your space and help you optimize energy efficiency. Check out this video to learn more about how LED lights can enhance your recessed lighting. When you concentrate on your interior lighting, you can add even more dimension to your interior design.